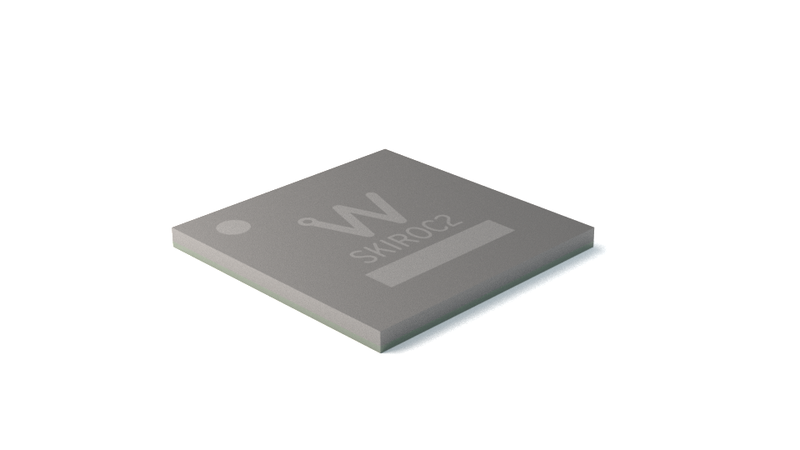 SKIROC 2A is a 64-channel front-end ASIC designed to readout silicon PIN diodes. Each channel is made of a variable-gain and low-noise charge preamplifier followed by two shapers – one with a gain of 1 and the other with a gain of 10 – to provide a charge measurement from 0.2 fC up to 10 pC. 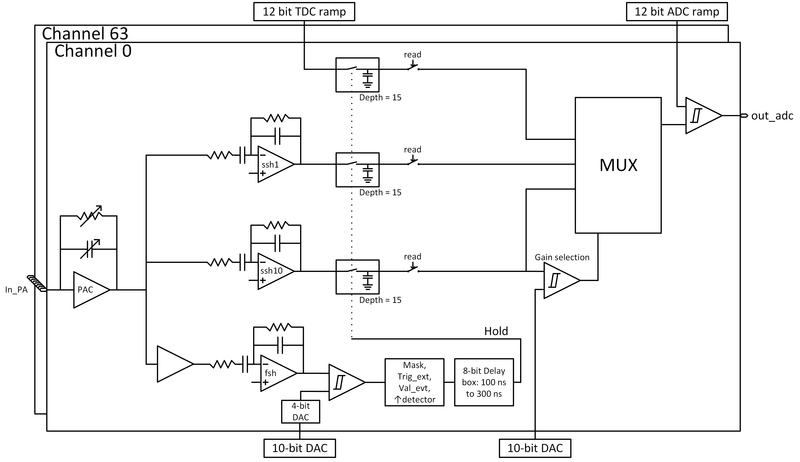 A time tagging is performed by a 12-bit TDC ramp. The charges and times are stored in a 15-depth Switched Capacitor Arrays (SCA), the values of which are converted by a multi-channel 12-bit Wilkinson ADC and sent to an integrated 4 Kbytes memory. The analog value of the charge is also available on an output pin. The trigger chain is composed of a high gain fast shaper and a discriminator and allows each channel to auto trigger down to 0.2 fC. Thresholds of the 64 discriminators are set by a common 10-bit DAC and an individual 4-bit DAC per channel. Each discriminator output is sent to an 8-bit delay cell (delay time tunable between 100 ns and 300 ns) to provide the Hold signal for the SCA cells of the slow channel. The power consumption is 6.2 mW/channel and each stage can be individually shut down when not used.